Since this book is third in a ten-book series and is over 1200 pages long, a synopsis would pretty much be the size of a full review. I’ll just skip it, and if you’re interested in one, GoodReads has a tidy (though truncated) summary. Instead, I want to focus this review on my experience of this book. I already knew that Oathbringer would top my list of favorite books of the year. I’ve been anxiously awaiting the book since reading Words of Radiance in early 2016, and I haven’t been this excited for a book release since Deathly Hallows in 2007. Favorite author, one of my favorite series…it had to be a favorite, right? 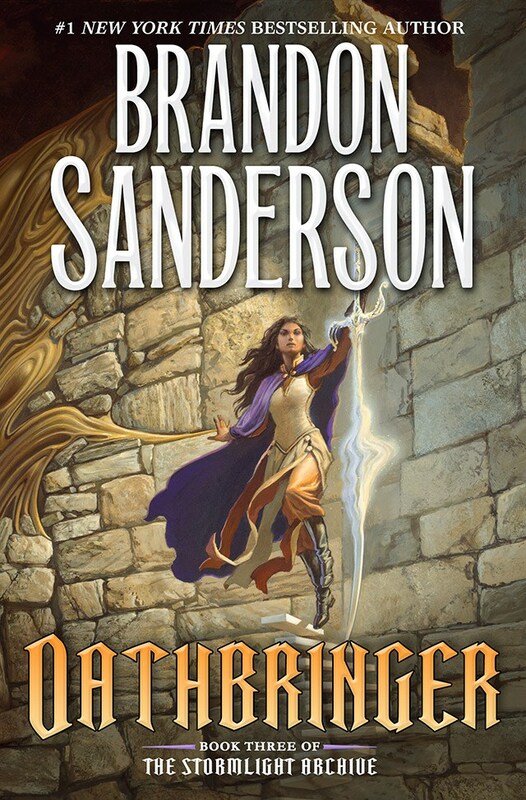 I followed along with Tor’s weekly installments for months, eagerly reading Part 1 (of five) of Oathbringer. Nothing contradicted my expectations. The question, as I went into the full read of the book on the release date, was only whether or not it would surpass Words of Radiance in terms of favorites. There is far too much in one of these books to process in one go. Like I said, over 1200 pages, multiple storylines, and beyond all the different plots wrapped together, there are the threads that tie together a great majority of Sanderson’s books. They all take place in the same universe, with characters that cross from one world to the next, new information from new books shedding light on things you read and learned years ago. I’ve said it before, but I love this interaction of worlds so much because, as a child and adolescent, this is exactly how I wanted to write, with all of my books interconnecting in some way. 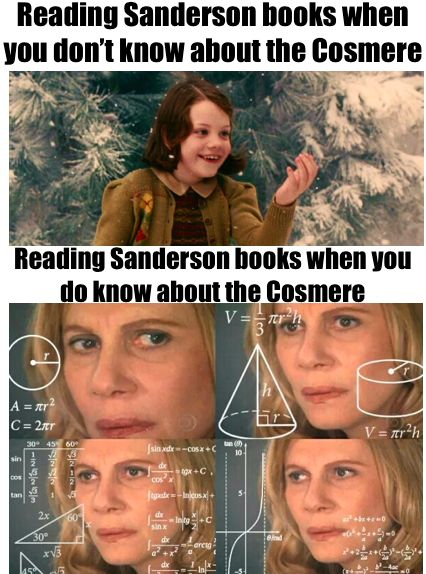 Sure, you can read the books without caring about Sanderson’s universe (called the Cosmere), but you can also dig into them and find all the little hints and theories and threads. I’m part of this latter group, which means that multiple rereads are often not only justified, but pleasant. When I bought the book on release day, I picked up where the Tor installments left off. For three days, I binge-read. I didn’t want to go too fast and miss a lot, but I also knew that I would be rereading via audio afterwards. My experience of this book is two-fold, because the initial binge-read was very different from the audio reread. When I finished the book the first time, I honestly didn’t know how to feel. Yes, I knew I loved the book, but there was so much to take in that I couldn’t really form coherent thoughts. Most of my scattered ideas boiled down to one thing: this book was HARD. Not hard to read or tough to get through, but hard emotionally, and on me personally. It dealt with some things that are particularly difficult for me to read about, like addiction and dissociative identity disorder. It was also a very violent, bloody book with a lot of morally reprehensible actions, often in context of war. And then there were just so many sad, sad, hopeless things that happened. I had this vague idea that there was a point where the book began to improve (emotionally), or ease up at least, but on first read, these were just impressions. A reread – a slower reread – was definitely in order. Honestly, I went into the audiobook with trepidation. When you go through a book that is very hard on you, part of you resists going through it again. The part of me that wanted to experience the book in a better way won out over my hesitance. I began, and I listened over the next two weeks. This is where the truly amazing experience of this book came to pass. As I said before, the book is broken into five parts. At the end of Part 3, lots of Bad Things have happened. There are some seriously depressing moments. Gut-wrenching, when you’re invested in these characters. This is the fling-the-book-across-the-room part of the story. Some interludes follow as they do after every section, and then Part 4 begins. And we just keep plodding along. Things go slowly, step by step, from Bad to Hopeless. Sure, there are some lighter moments throughout, but this is seriously like hitting a wall when you’re out running and continuing to push against it forever and ever and ever. Part 4 ends, and the story feels so hopeless that you don’t know how you’re going to make it to the end. Interludes, and then Part 5 starts…and more Bad Things happen. There’s never a break! It’s just boulders piling on top of you, one after another, for hundreds and hundreds of pages. It’s hard. It’s so well-written, but you’re just in agony for all these people that Sanderson has made you love so much by this point. This doesn’t sound terribly appealing, does it? Here’s the thing, though: About a quarter of the way through Part 5, there’s a single moment of redemption and change and hope. And it’s such a huge contrast to the last 300-400 pages that it flips a little switch in your brain – or, well, at least it did in mine. It was like breaking through the wall while running and suddenly having your body feel amazing. Adrenaline and endorphins flowing all over the place. And it doesn’t end there, because that one tiny moment escalates into dozens and dozens of little turns, changes, and bright moments of hope. After all that darkness and pain and hopelessness, the reader is bombarded with possibility, sharp and fierce for the contrast. Don’t misunderstand – this isn’t some magical deus ex machina and then everyone lives happily ever after. There are still Bad Things. It’s a war, after all. But in the balance of hope and pain, the scales tip, and suddenly you can breathe again. Air feels really, really good when you’ve been drowning. I’ve never, ever read a book that pulled off an experience like this before. I’m still too close to the book to fully know how I will feel about it – in comparison to others in the series – in the long run. At the same time, I know that it’s a truly brilliant work of fiction, masterful in every way. Difficult it might be, but I will definitely be revisiting Oathbringer many times in the future. Performance: Michael Kramer and Kate Reading do a fabulous job, as always. I was particularly amused by the way they each handled the voices of the spren normally read by the other narrator. This entry was posted in 2017, 2018, Adult, Prose and tagged audio, comfort, divinity, dream-invader, favorite, memorable, multi-read, psychology, reread, shredded me, speculative. Bookmark the permalink.